By now, most people know and understand what social media is and how it’s become truly integrated as a means of communication in society. But the term social business — also known as social enterprise, collaborative company and social organization – is less known and wasn’t even used until a few years ago. 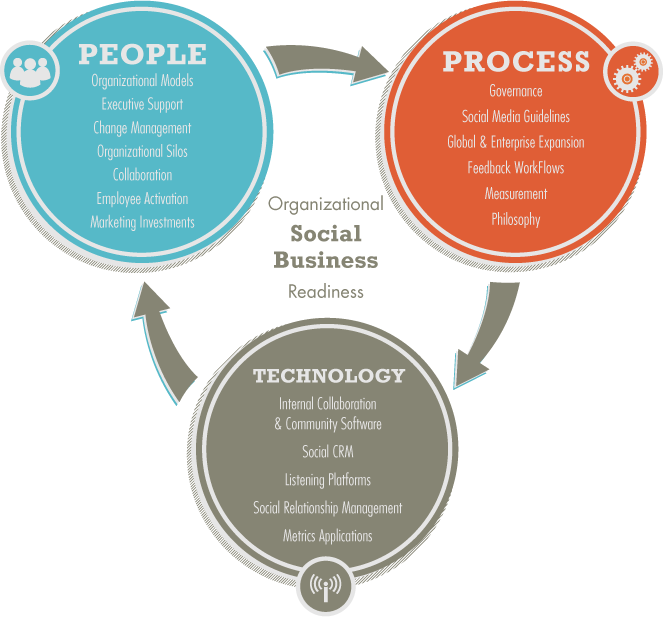 Social business is the ability to integrate social communities and tools into an organization’s business processes, goals and employee engagement. The act of becoming a social business is only now becoming mainstream as companies realize its importance. 52% of executives say that social business is important to their companies today. 86% says it will be vital in three years. Why is Elsevier becoming a social business? For various reasons, including the events from last year when an author boycott brought our company into the social spotlight. The conversations within the research community on social networks were heated and controversial and raised a lot of questions. At the time, Elsevier did not have centralized social media channels and practices that could have helped us better respond and answer some of these questions. We quickly realized In order for us to be in these conversations with the research community, we needed to get serious about social engagement. Six months ago, I was brought on board to lead our new social team and business efforts. I had worked for Elsevier’s publishing business, and my background with social media programs, training and governance – as well being a user of social media on a daily basis — proved to be a good combination to start making our company transparent, responsive, collaborative and engaging both internally and externally. The winners talk about their work and how this award will help them. How are we becoming a social business? “A social organization is built upon three pillars – people, process and technology,” explains Michael Brito (@Britopian), Senior VP of Social Business Planning at Edelman Digital and author of Smart Business, Social Business. “All three need to work independent of each other, yet need to be integrated into the DNA of organizational culture.” This is our philosophy at Elsevier as we continue the progression of transforming into a social business. The framework for social business is smartly outlined by Web Strategist Jeremiah Owyang (@jowyang), Industry Analyst Partner at Altimeter Group. Elsevier’s approach is close to the multiple hub and spoke – or “dandelion” model. That means we are organizing our social structure to flow into already established business objectives. The important part for our communities is the corporate presence. While very formal sounding, it’s actually a practical way for us to talk with you on a more intimate level. As stated earlier, Elsevier previously had no “official” outward-facing platform. Six months ago, you wouldn’t be reading an article like this because there wasn’t a place to disseminate this type of information to Elsevier’s audiences. The company needed its own general social platform — a place to communicate not just by telling people what we do but by showing and discussing interesting activities and topics from throughout Elsevier and the greater research community. From that need, Elsevier Connect was born, and compatible corporate social profiles were developed on Twitter, Facebook, LinkedIn and Google+. It’s also a way to make our company’s leaders more accessible. Over the past six months, Elsevier has made great strides in engaging, opening up and talking to our communities, that is – you. We’ve heard from many of you already, but please keep the feedback coming and keep watching us for continual updates on our progress and activities. We are excited to share these with you. I am curious why you feel it is necessary to develop a corporate presence on social media? Thanks for your comment. Mainly for the reasons stated above, but also because it's now common best practice to have a central presence for a large company.